This project is a bit too fiddly for young children to make, but finished, it’s a kid-magnet. The solar-power feature is a plus or a minus, depending on your interpretation of (and interest in) the rule about a menorah and “work.” Lights from a Hanukkah menorah are supposed to provide illumination, but not in order to facilitate “work.” (Work is not prohibited elsewhere in the house.) But, what if the lit menorah actually triggers work as worked by the menorah itself? What if that sensor makes the menorah flap and nod throughout the whole blessings and candle-burning time? The Talmud doesn’t say anything about solar-powered menorahs (even ones that are not shaped like cartoon turkeys), so you’ll have to appeal to your Authority of Choice on this one. The question may seem wacky to some, but it makes a great teachable moment for older kids, and I’m certainly including this menorah in my Kosher Menorah Quiz for the school’s Chanukah program. I promise, the Shamash is indeed higher. hex nut or some other firm spacer to distance the craft stick from the bird. 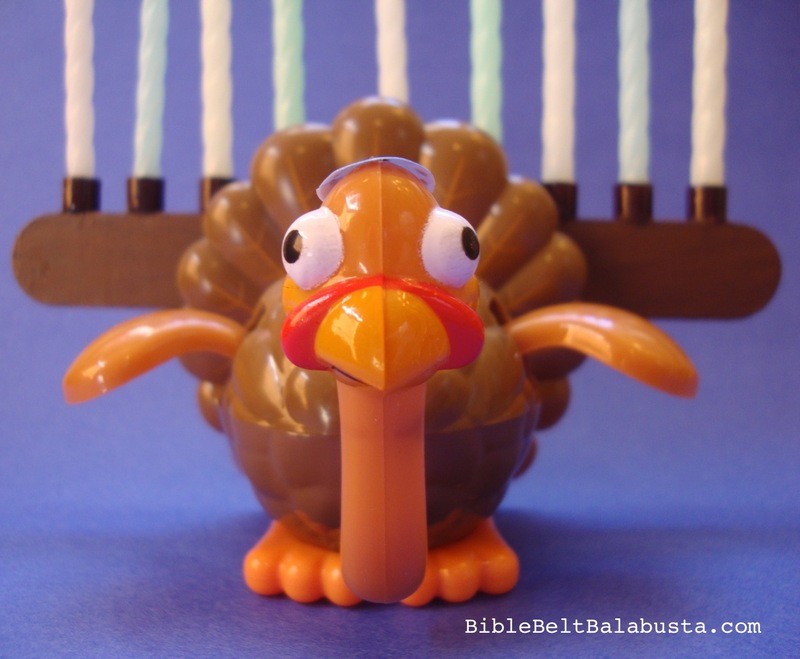 You don’t want lit candles touching your plastic turkey. small dot label (Avery) or see alternatives below. 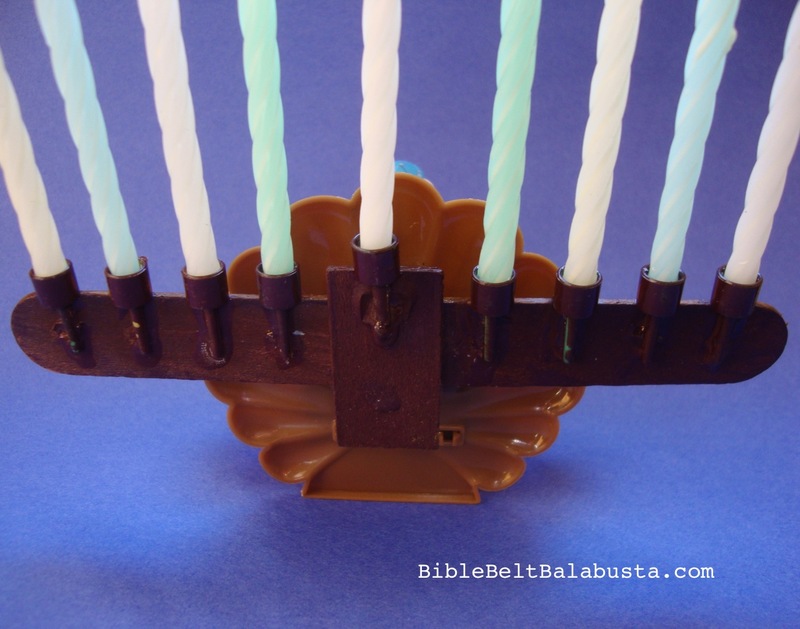 • Superglue 9 birthday candleholders to a jumbo craft stick, elevating the shamash on a biscuit of wood. See photo below. • Superglue a hex nut to the middle back of the bird, at desired height. • Superglue the stick to the hex nut. • Make a kippah. Mine is a small dot label from Avery. Cut one slice to the middle, then pull ends toward each other to make a gently conical disk. Decorate with metallic Sharpie. Or, just cut a wee circle from the sticky edge of a Post-It. Or, shoot, just take a one-hold punch to a Post-It, open the punch to retrieve the single circle and use that. SAFETY FIRST: Never leave any lit menorah unattended. Always place a menorah on a nonflammable surface to catch any stray drips or fallen candles. If you are concerned about the safety of this or any menorah I’ve written about, do not make it. Try an LED tealight version (here and here) or flameless LEGO versions instead! 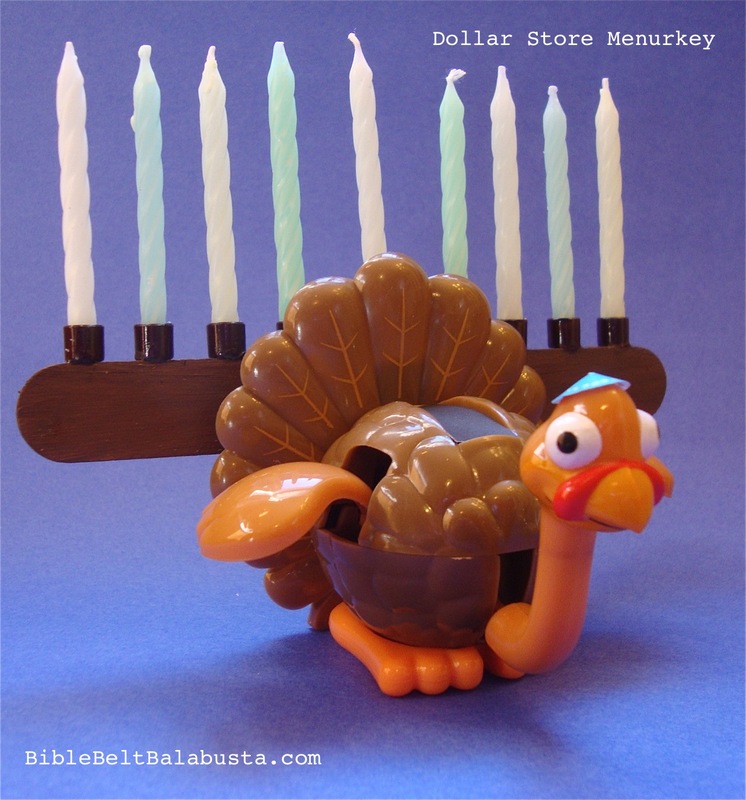 This entry was posted in Activity, Hanukkah, Kitsch and tagged menorah. Bookmark the permalink. Can I just say how awesome it is to find someone that gets it!!! I absolutely LOVE this idea! Thanks for sharing! I can;t wait to share this with my fellow West Coast Jews! Thanks, Erika. I’d love to see pictures! Awesome! Also, according to my Rav as long as you have the shamash doing the “work” it is permissible. So no quandary necessary. Thanks, Moti. I’m awaiting local word now… So curious what the answer will be. Oh my gosh – so adorable and cute! Looking for a Dollar store right now!!!! There weren’t any at my Dollar Tree…but I will keep looking! Oh no. I just checked online and they are out of stock, but you wouldn’t have wanted to order bulk anyway. Good luck! I love it!!!!!!! You are AWESOME!!! Ebay has them – cheap!! (or is that “gobble”?) Delivery next week. Aliza, thank you for the tip. I added it (credit to you) on the facebook post in case other folks are coming up empty at Dollar Tree.